Neil Katsura is the Clark Kent of kids' dentistry. A mild-mannered working professional on weekdays, he and his team of eight pediatric dentists at Aloha Dentistry diligently work to maintain the bright smiles of more than 11,000 children each year at their offices in Orinda and Berkeley. But in his off hours, this Orinda resident turns into a would-be superhero delivering care for the world's most vulnerable - children at home and abroad living in poverty. A passionate advocate for the eradication of healthcare disparities, he regularly mounts mission trips to the Philippines and Guatemala. 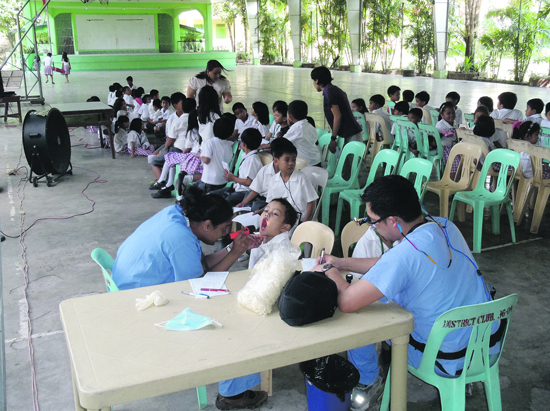 Dental students from Columbia University and the University of California, San Francisco assist him in treating as many as 200 children each day. His wife, Jane, provides post-operative nursing care. As this article was headed to press, Katsura and his team were set to fly into Manila before driving about 30 miles to their base at Makati. They will then head for Taguig and areas so remote that many residents still use unfiltered drinking water and cook over open fires. "We try to triage the kids who have the worst problems and take care of their immediate needs," he explains. Sometimes, they'll see patients with unusual genetic issues but mostly, they just focus on treating infections and relieving pain. "The severity of dental decay is extreme...A lot of teeth are decayed to the gum lines." Dental care is a luxury when one lives on as little as a dollar per day. Here at home, more and more parents need federal assistance to pay for dental visits. As a result, their children are unable to receive timely treatment because many private practitioners no longer accept the state-subsidized insurance known as Medi-Cal. Parents and kids are often now forced to travel hundreds of miles to university and children's hospitals for help. "Unfortunately, Medi-Cal's dental program is currently failing too many children," observed Wendy Lazarus in a recent Huffington Post article. "For starters, half of the children enrolled in Medi-Cal did not have a dental visit in 2011." Lazarus, the founder and co-president of The Children's Partnership (www.childrenspartnership.org), noted that parents whose children need "simple dental treatments, like fillings, find their kids on months-long waiting lists for the few dentists that accept new pediatric Medi-Cal patients. Without prompt attention, cavities can turn into abscesses, and toothaches can turn into extractions." And when kids are in pain, their schoolwork suffers. "The biggest frustration that I see in this country is that we have so many resources, but so many barriers," adds Katsura who decided six years ago to partner with Lifelong Dental in Berkeley so that parents may still obtain qualified care for their kids during times that won't interfere with work or school. One Saturday each month, residents from UCSF's pediatric dentistry program treat those most in need while learning important professional skills under Katsura's tutelage. The clinic accepts Medi-Cal, and also offers sliding scale payments. But because demand is growing, Katsura needs additional support. He hopes corporate and individual donors will rally to help expand the clinic's hours. A Bay Area native, Katsura earned his DDS degree from UCSF in 1984 and completed his pediatric and hospital dentistry residency there and at Children's Hospital Oakland in 1987. He credits much of his passion for children's healthcare to the summer internship he performed with Dr. Joseph Wampler, the mentor and friend with whom he has practiced for 25 years. Among his many professional activities, he serves on the dentistry attending medical staff at Children's Hospital and as a part-time Clinical Professor of Pediatric Dentistry at UCSF. To learn more, check out The Children's Partnership briefs on statewide dental health, and visit lifelongmedical.org/patient-guide/locations/dental-care-office. For information about Aloha Dentistry, visit alohakidsdds.com. Who was that masked man? 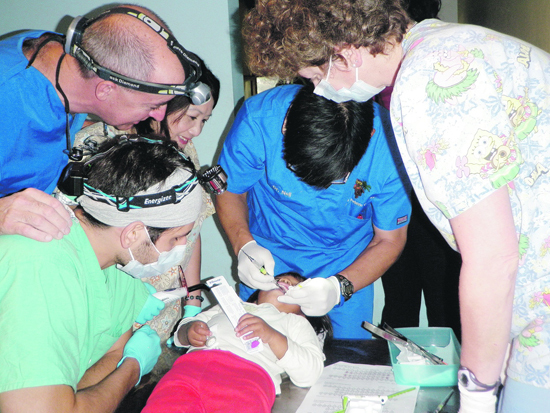 Orinda's Neil Katsura, DDS cares for one of his tiny patients in the Philippines. Fellow superheroes on this mission: Columbia University dental student Mike O'Brien, DDS; Emmy Ortega, RDA; and Karen Cerruti, RDA.